In 2007 I wrote my first ebook with the help of a coach. I thought it was going to catapult me to a white beach in the Caribbean with a banana smoothie in my hand. I now see how foolish my expectations were. The ebook ended up failing gloriously. It’s embarrassing how many mistakes I made. It would take me several years before I had the guts to approach creating my own products again. I was jaded and I blamed everything around me. I thought ebooks were dead, but the problem weren’t ebooks, the problem was me. I spent 2008 and 2009 avoiding hating ebooks (and creating my own products) because to be honest, they scared me. I had tried once, and I had been defeated. I didn’t want to do it again, because I didn’t know how, or where to even start. It didn’t help that having actual customers scared me. I was more than happy to hide behind-the-scenes as an affiliate marketer. I tried to justify my decision by thinking that ebooks were dead, or that there was so much crap out there that I didn’t want to add to it. But I realized that the fact that there was a lot of bad ebooks out there was the exact reason why I should jump in. I care about the products I create. And if all the people that care don’t contribute because there’s too much crap out there, where will that leave us? I launched this blog in late 2009, but it wasn’t until around March 2010 that I launched my first successful ebook. I was finally ready to conquer my fears. My first successful ebook was about how to use article marketing to get more traffic, subscribers and sales. It was called, Article Marketing Traffic Booster. It’s no longer available as a stand-alone product. So, how did I succeed? I listened to my audience. I wrote articles about my strategies, and people were interested, especially on the topic of how I was using article marketing. I then looked at the competition. There were plenty of books on article marketing and traffic building, so I dived in and wrote an ebook on the topic with a few bonuses. I ended up selling 4-figures of the book within just a few days to a small email list of just 700 subscribers. Just goes to show you how important (and powerful) having a responsive email list is. I was surprised and encouraged. So, a few months later I wrote my second book, Passionate Living. I listened to my readers, but this time I also surveyed them and asked what their biggest fears and frustrations were. I then compiled all the answers and took the main problem areas and created Passionate Living. This time around I knew more about what the ebook creation process looked like, so I got Passionate Living done in less than 14 days. And the work I put in during those 14 days has kept rewarding me ever since. I started by just selling an ebook at $9.95, and it has since then evolved into a full-blown course sold at $35. It has sold hundreds of copies. All this despite the lack of promotion for it. But even with two successful ebooks, I ran into a big problem. I failed to keep doing what worked. It sounds so ridiculous looking back, but it happens often. What I would’ve done differently if I had to do it all over would be to keep creating products that helped my audience. Instead I wrote blog posts, hung out on social media, and took the easy way out. I hid from my fears instead of facing them head on. My readers and customers were asking me questions and practically telling me what they wanted, such as how to find a niche and how to write articles people love. But I didn’t do anything. I don’t know why. At one point I became depressed, because I wasn’t seeing the results I wanted, which is funny, because I wasn’t doing the right things, yet I was expecting results. I’m still surprised at how easy it is to do nothing, then blame all of it on something else and give all your power away. All of this frustration led me to go back to what I knew: affiliate marketing and advertising. I started creating niche sites again, but something was off. It wasn’t what I truly wanted to do. I thought I could keep pushing, make a living, and then do what I wanted on the side, but I just couldn’t take it. What I really wanted to do was to help people use technology and the web to do work they loved, so they could live the life they wanted. I kept getting ideas and inspiration in this direction, but for a long time I ignored it. I wanted to create products that were simple and produced real, actionable results, which many products out there failed to do. I felt deep down that I had something to share. And if you’re reading this, I’ll bet that you do, too, but something is stopping you. What was stopping me was fear. Fear of not being good enough. I didn’t think I had anything to contribute. Luckily, after a while I had enough, so I came back to what I do today. I gave up on building meaningless niche websites, and I decided to take things to the next level. I was once again ready to move on. I started thinking about how I could add even more value to the ebooks I created. How could I help my customers get even better results with even less work? Was it even possible? I started working with Chris Garrett, and we started brainstorming. 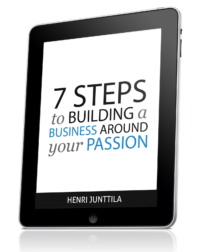 It led to me creating a line of online workshops to help people build an online business around their passion. In the last six months, I’ve created 3 online workshops, which is just using ebooks and bundling them with audio, workbooks and so on. And there’s more coming, namely one in August on how to write and sell an ebook in 31 days or less. It’s specifically designed for people who don’t think they are an expert or are afraid they can’t write well enough to sell an ebook. It’s easy for me to sulk and complain, to look at others and wonder why they are so successful. But if I want real results, I have to put in real work. Now I focus on taking action instead of analyzing too much, because it’s not so much about getting the perfect product out there. Instead my mission is to help people as fast as possible, then listen to their feedback and improve what I do. So this is not about coming up with the perfect idea. It’s about starting and taking things one step at a time. All of this has brought me to the realization that if I don’t enjoy the journey, it’s not worth doing. I’ve gotten pretty good at writing ebooks. I can do it fast, and I can keep things tight. And above all, I get things done. If I’m not doing work I love, then why am I doing it? Just to have money in the bank? Or to maybe someday retire? I’ve become increasingly sensitive to following my passion. And even though that sounds cliché, it’s true. I’m doing what I love, which is to help you. This doesn’t mean everything is smooth. I still have to face my fears. I have to work hard, but in the end, I love every second of it. One of my bigger a-ha moments was that this is not about making as much money as possible. Having a lifestyle business is about having ENOUGH money to live the life you want. It’s about eliminating the unnecessary and focusing on what you truly enjoy doing. I’ve faced internal demons, but I’ve kept going. For me, it always comes down to ruthlessly taking action. It doesn’t matter how I feel or what I do. If I’m not getting the results I want, I have to change my approach and focus on what works. I have to leave my ego at the door and look at things objectively. And if I want to speed things up and avoid mistakes, I’m going to work with a coach or join a training course that will help me do that. Creating the life you want is not easy, but it is possible. Just a few years ago I was miserable, and now I love what I do. Hey Henri, thanks for keeping this real man. It’s not very common to see someone that is successful already accept any kind of mistakes or that if it’s needed, getting a coach to get things done right, fast and accomplish your main objective flawlessly. To me, that’s a huge personal improvement you’re doing right now and for things like this, is that I respect you and read you every day. Hope the best for that launch and looking forward to see what you’re cooking man, all the best! To me, mistakes are key. There’s no use in avoiding or hiding them, because that would run counter to what I want to accomplish. I really identified with the above comment. I felt a lot of what you said in this article. I would like to write an e-book for a variety of reasons, mostly so I can make some cash doing something I am good at and that I enjoy doing. However, I have all the same issues as you, mostly finding it less painful and frustrating to do nothing and very easy to blame others for my own failings. I have actually figured out that I am responsible for me and have, thankfully, learned to take responsibility for my own actions and life (most of the time, sometimes I fall back to my old ways). I still expereince huge amounts of anxiety and an inability to figure out exactly what I really want from life. Compounding all of this is the feeling that I am running out of time. This feeling stems from the fact that I am getting older (as are we all, of course) and that my late husband did run out of time and passed away recently at age 57. So, these are my comments. I may or may not purchase your products. Most likely not as its my personal policy to be extremely careful about purchases, in particular online purchases from websites such as yours. I am drawn to your subjects: passionate living and how to write an e-book, both subjects of which I would like to further pursue. Thanks for writing a great article, I enjoyed reading it. I am glad I joined your list. I think we’re at a time where a lot of people are realizing that possibilities are opening up. Unfortunately it also leads to a lot of anxiety, at least that was the case for me. But in the end, I’ve learned to be less harsh on myself, because I can only do what I can do. And no worries, it’s understandable to be skeptical about online purchases. Even so, you’ll find a lot of information on my site for free that will help you move forward. Henri, while i was reading your reflection above I could see myself in everything you wrote. Fear has been my biggest stumbling block. I never finish anything because as long as its unfinished I can say to people that there is still more to go (that way I won’t be criticised). The dayI launched my website I wanted the world to swallow me up…I was so afraid that people would think it silly. My fear was completely irrational. I have moved on from that point but still self doubt arises from time to time. I am nearly finished my first ebook and I am hoping that I won’t go through the same terror barrier I went through with the website. The journey is interesting and each challenge brings me a greater depth of understanding about myself. Thank you for leading by example and reminding me, through your honest post, that what I am going through others have too …and they succeeded. Wish me luck! You know, it’s funny, because I went through the same stuff in the beginning, and with each new project, the same fears came up. However, after a while it started to seem ridiculous, because I became aware of the same fears playing in my head over and over again, like a broken record. That’s why I think it’s so important to take action, because, like you said, we learn so much about ourselves in the process. You hit the nail on the head in so many ways with this post. I’ve been through them all myself and understand completely what you’ve gone through. I’m at ‘taking things to the next level’ myself right now. It’s a big step, however brainstorming with Chris Garret would probably get anyone to fight off fear and take action. I’m sure he’s a great motivator for you. This is all amazing stuff, and the main point is that we all go through the exact same emotions, but the key point here for me is that, it helps that you are completely honest with where you are, as it can sometime seem always too far away following the guru’s that have obviously still been through the same issues, but seem to be squeaky clean now nd everything is perfect, but it is so nice to go through it with someone that is just a step ahead of you, if you know what I mean. You know, I think some of the guru’s are going through the same stuff. The problem is that they don’t share what’s really going on, because they think they have to uphold a certain kind of image. Gracias for the comment, sire! Just back from 4×12 hour days at an NLP refresher seminar so I’m somewhat spaced-out and sitting here attempting to create order on my laptop and in my head! I was collating your e-mails into folder headings and stumbled on this post. It’s all good either way..Thanks as always. The post-confusion of an NLP seminar is always fun.